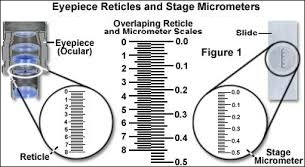 The measurement of specimen size with a microscope is normally made by using an eyepiece graticule sometimes referred to as a reticule. This is a x10 eyepiece that has a scale inserted which is in focus at the same time as the specimen. Alternatively when using a digital microscope or digital microscope camera the software will often allow image measurement without the need for a graticule (measuring) eyepiece. This fact sheet deals with how to measure using a measuring eyepiece and a stage micrometer. For measuring with digital camera software please refer to the software instructions, but a stage micrometer will be needed to calibrate the software. focal. Brunel Microscopes measuring eyepieces complete with scale for both compound microscopes and stereomicroscopes. These are listed in the accessories of the various microscopes in our range. With both types the image of the eyepiece micrometer (scale) is superimposed onto the specimen image, both being in focus at the same time. In other words the specimen appears to have a ruler lying across it. Clearly the size of the eyepiece scale remains constant, despite the fact that the image viewed will change its size depending on the objective magnification chosen. For example a pollen grain viewed with the x40 objective will appear down the microscope very much larger than when viewed with the x10 objective. However because the micrometer scale is in the eyepiece it cannot change its size accordingly. The real value of each of the eyepiece scale divisions therefore varies depending on the objective magnification used. It is necessary therefore to calibrate (or calculate) the value of the eyepiece scale divisions with a real scale placed on the microscope stage for each potential magnification to be used. This is called a stage micrometer, and is in effect a very accurately etched ruler in the centre of a microscope slide. Usually the scale is 1 mm divided into 100 parts or 1cm divided into 1000 parts. The Brunel Microscopes stage micrometer has both small and larger scales and is suitable for both compound and stereomicroscopes. The appropriate size scale is chosen for calibration. To measure specimens with a microscope needs both an eyepiece with a scale (called graticule or sometimes reticule) and a stage micrometer which is a microscope slide that has a real scale or scales etched onto the surface.